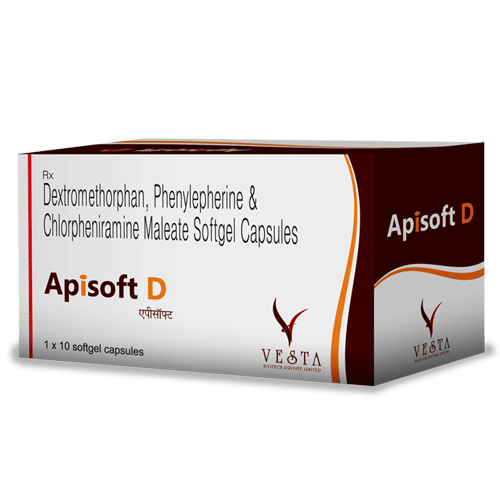 1 – Dextromethorphan – It is cough suppressant that suppresses the cough acting on the CTZ (Chemoreceptor Trigger Zone) area of brain unlike codeine that acts on the brain, which not only relieves cough but is also a habit forming drug. Dextromethorphan therefore, scores over codeine. 2 – Phenylepherin – It is a nasal decongestant that stops watery nose and congestion in the nasal area and reduces redness of the eye. 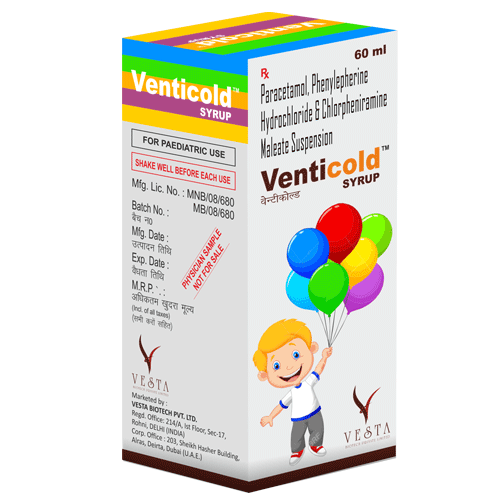 Offers immediate relief from distressing symptoms like sneezing too. 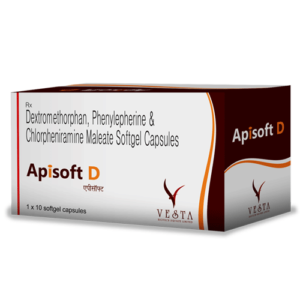 3 – Chalorpheniramine Maleate (CPM) – It is a very powerful anti-allergic and control the allergic reaction that are the precursors to the dry cough. Controlling allergy will prevent the progress of dry cough and associated symptoms. 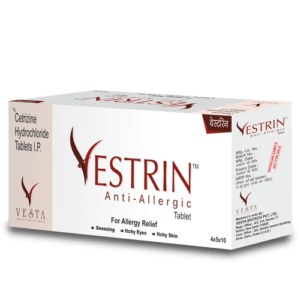 Cetirizine – is an anti-allergic (anti-histamine) agent that helps stop allergic reactions and prevent inflammation (as seen in Vestrin tablets). In allergic rhinitis, cetirizine also helps reduce redness of eyes, prevents watery eyes and stops further progress of sore throat. 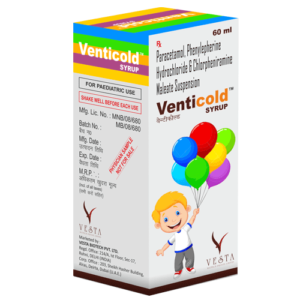 Phenylepherine – is a nasal decongestant that helps constrict the nasal blood vessels and prevent oozing out of the fluids and thus leading to runny and stuffed nose. 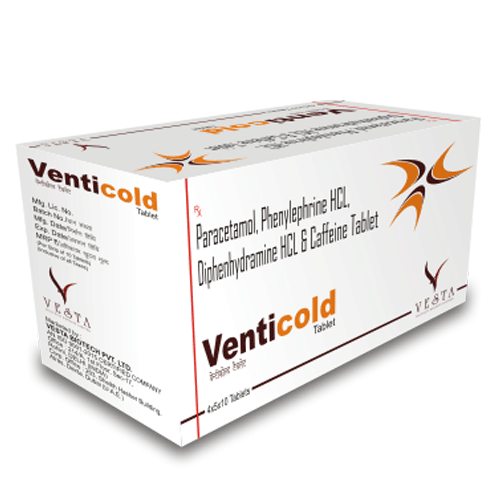 Paracetamol – helps reduce associated malaise and fever with headache. 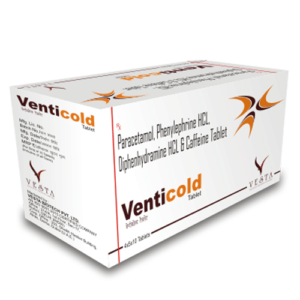 Caffeine – in Vanticold tablets acts as a CNS stimulant that relieves sedation due to the symptoms of allergy or common cold. There are conditions of respiratory tract where the airways constrict, which makes it difficult to breath and when the body demands more oxygen, it becomes increasingly difficult to meet the needs and the person starts breathing vigorously. This condition is commonly called as bronchitis (inflammation of the bronchial tree). This condition is commonly seen in asthma. Children need immediate attention for bronchitis so that they can breathe easily and relieve breathlessness. The objective in the management of bronchitis is to relieve bronchoconstriction. This can be achieved by bronchodilation. 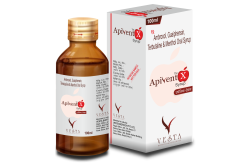 Apivent X is the cough syrup used for productive cough. 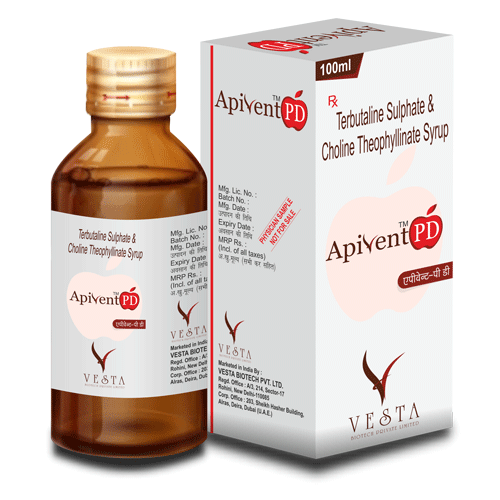 Productive cough is generally due to the underlying throat infection, thus anti-infectives are required along with an expectorant to relieve productive cough. 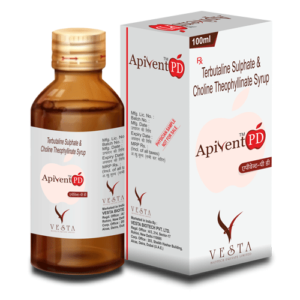 • Terbutaline Sulphate, Ambroxol Hydrochloride, Guaiphenesin, Menthol In flavoured syrupy base q.s. Apivent D is syrup for dry/allergic cough. The term allergy is used to describe a response, within the body, to a substance, which is not necessarily harmful in itself, but results in an immune response and a reaction that causes symptoms and disease in a predisposed person, which in turn can cause inconvenience, or a great deal of misery and even death. An allergy is everything from a cough, runny nose, itchy eyes and palate to skin rash. 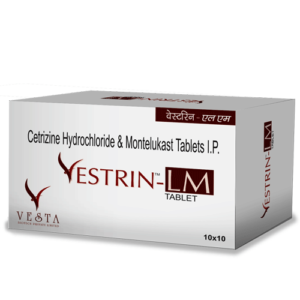 Levocetirizine – is the active analogue of cetirizine and is used as H1 receptor antagonist to prevent the action of histamine on it and the progress of allergic reactions. Montelukast – is a mast cell stabilizer that prevent the rupture of mast cells and release of histamine. This prevents the allergic reaction to start as there is no histamine at the tissue level to start allergic reaction. 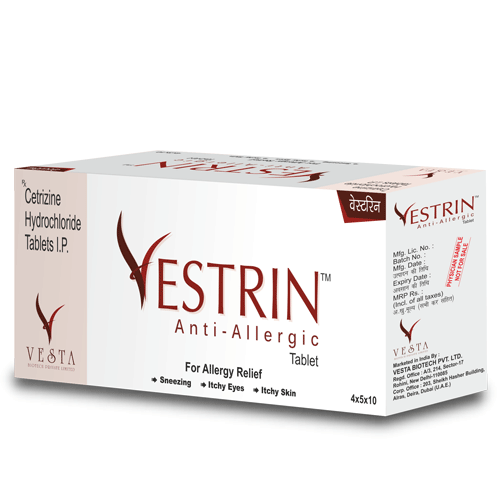 Cetirizine – acts as H1 receptor antagonist to prevent the action of histamine on it and the progress of allergic reactions. 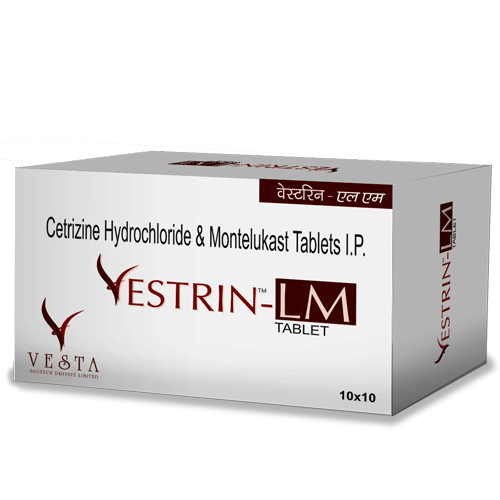 Cetirizine is the most trusted anti-allergic used to combat allergy.